Moving long distance from San Diego County, CA? Big Box Storage has the convenient, low-cost moving solution you're seeking. Below please find a listing of the current rates for shipping a Big Box(es) from San Diego to your desired state. Today's quoted rates are valid through June 22, 2019. The base rates listed provide for the initial delivery and pickup of your rented Big Box(es) to/from your San Diego area address, 30 days of free storage with the Big Box Storage San Diego facility, and shipping to the company’s affiliate facility in the city nearest to your destination.For an additional fee, the Big Box(es) can be delivered directly to your new address (as opposed to the affiliate facility closest to that address). For a complete listing of all metro areas covered within your destination state, please click on the particular state name in the below chart. Rates are subject to the terms and conditions contained in the Quotation form provided to you prior to shipment. Need assistance with determining how many Big Boxes you'll need? While each Big Box measures 8' x 5' x 7' tall and can typically hold up to a room and half of contents, please also feel free to utilize the online space estimator. Questions or comments? In need of a shipment quote for more than three Big Boxes? Shipping to Alaska or Hawaii? 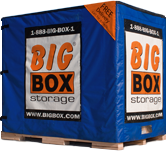 Please contact a Big Box Storage representative directly at 1-800-391-4890. You may also schedule your long-distance shipment online via the Shipment Scheduling page. Moving long distance from San Diego County, CA? Big Box Storage has the convenient, low-cost moving solution you're seeking. Or call us to schedule your shipment!